We've all heard of Kalamata olives, so it's no surprise that the Kalamata region, Messinia, of Greece, is an area full of olive trees. 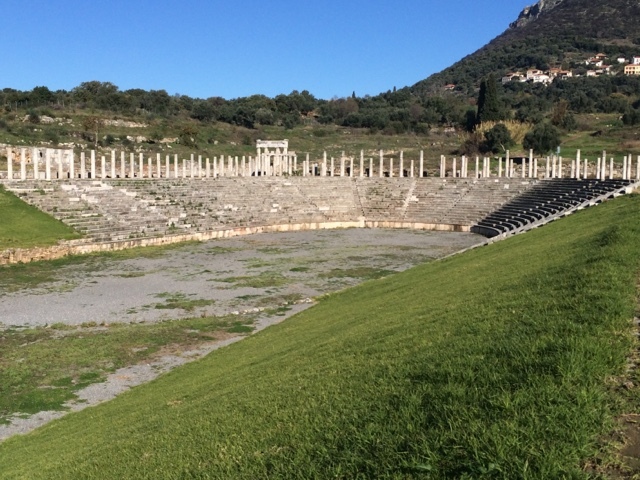 This region provided us the opportunity to visit the spectacular archaeological ruins of Messene. I hadn't heard of these before researching Greece, they aren't much visited as they're a bit off the beaten track, but they are well worth the visit. They've impressed me more than any of the other Greek sites. 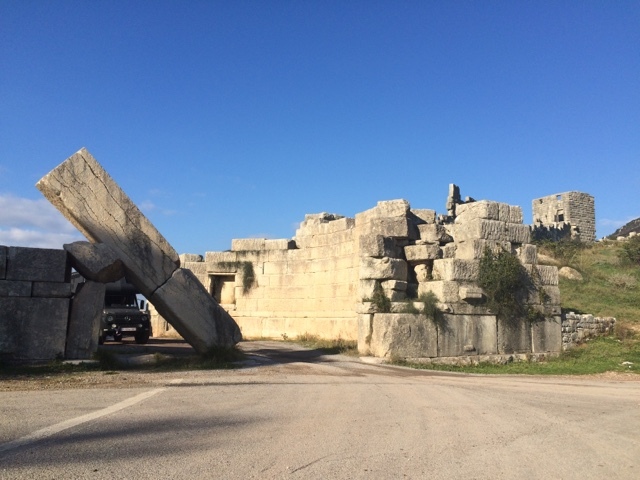 The Messene ruin site is big, even before reaching the fenced off site the road led Blac through the monumental west gate of the city, known as the Arcadian Gate! See Blac? The road goes right through the ruins of Arcadia Gate, Messene. Within the site you walk among interesting ruins each part seeming better than the last, until you get to the ancient stadium and gymnasium, at which I exclaimed "oh, that's beautiful!, it's just amazing!". None of our photos do justice to the Messene Archaeological site, you should visit. After visiting Ancient Messene we had a few hours wait as I'd made arrangements to visit an active modern olive (oil) mill. If you want to visit an olive mill you should come in the right season and make arrangements to visit. We visited Andelea-Benakopoulis Olive Mill (www.andela.gr or search on Trip Advisor too). Now is a great time to visit and, as they are busy picking the olives during the day, they are doing the milling by evening. At the mill the Production manager, Pavlo, was kind enough to explain how it works and let us taste some olive oil. 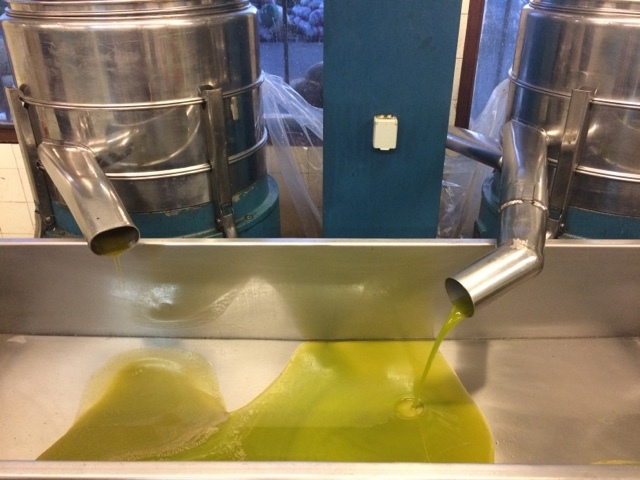 This olive oil was extracted from olives that were picked that day and processed right in front of us. The fresh product is very green and rather (unexpectedly) spicy. And, absolutely delicious! The day had a final unexpected delight. We left the mill in the dark, and usually we don't drive at night but we needed to find a pamp place. As we drove up into the countryside we spotted a pine martin. So cute! Until a few days ago I hadn't even heard of one of these but I'm reading 'Captain Corelli's Mandolin' (Louis de Bernieres) which is set on a Greek island near to this part of Greece, and the book features a pine martin (which I had to look up online). Final note for fellow travellers: we were also advised by a few people that one should also visit the Ancient archaeological site of Bassae. Unfortunately, it's opening hours are now just Monday to Friday (closing at 3pm), and we tried to visit on Saturday. If your timing is better than hours than try to do it between Messene and Olympia.